I woke up yesterday with the right side of my facing roaring like a lion. Pounding like the surf. Metaphor metaphor metaphor. Ironically, Matthew was the household member who had to leave early to make a dental appointment. Me? I rarely leave the house, certainly not to take the subway to anywhere fun, like a medical thing. I wasn’t certain that the pain was teeth, anyway, because while my mouth and jaw felt sensitive, I couldn’t pinpoint a particular problem. But over breakfast, things got pretty bad. With one side of my head throbbing along like a bass drum, I started to go down some grim alleys about what might be wrong. Spinal meningitis? One of those African worms that drills around in your body? I even didn’t drink my (fake, decaf) coffee (that I nevertheless need in order to feel and act human). My plan was to go back to sleep the minute the sitter was in the door, just in case sleeping would make me feel better. I decided to take at least a sick morning from work, if not a whole sick day. Matthew called to say that the dentist insisted that I come in right away, before the holiday weekend began, in case I was about to run into real trouble. What a great dentist! He even said I could bring the kiddo if I needed to. Does he know what the kiddo is like, Frankensteining around and trying to put everything in his mouth? Perhaps an oral fixation makes sense to the dentist. Perhaps he has straps to keep children in place. Anyhow, when the sitter arrived, I set off for the dental office. I used to send all of my single female friends to the handsome young dentist I saw. But then that guy disappeared from the practice and was replaced by another young dentist, whose salient characteristics — in contrast to the charm, pin-stripe trousers, BMW convertible, jokes, offers of valium, and flirting that I had become accustomed to — are hurrying, refusing to administer enough numbing agent, and then ignoring you when you are pawing at the air and moaning, wide-mouthed, in desperation. That’s ok, it was my plan to never see him again in my life. I would see the older dentist who owns the practice, who gets good reviews from my husband. That’s the dentist who’d suggested I come in no matter what, appointmentless. When I arrived, he looked at some x-rays and poked around in my mouth and announced that nothing is wrong with my teeth. So, what is wrong with me? You are on the edge of your seat. Do not fall off! It’s tension, he said. I’m grinding. I need to relax. The dentist gave up on my mouth and started rubbing my neck. He actually found some lumps that he said were discs, and slid them back into place. Whoa! I already felt way better. He told me to go to yoga, and that if I can’t cut down on using a computer or carrying a baby — does he not know that these are my two main interests? — that I could come back and get fitted for a bit. Like a horse. Meanwhile, I should try to enjoy myself. He waved me away and said that the visit was free. I love you, unusual dentist. In keeping with the decree that I must enjoy myself, and in keeping with the new potentially Western theme of at least my teeth, I bought myself some mustard yellow mini-cowboy boots on the way home. An impulse buy to match an impulse dental visit! 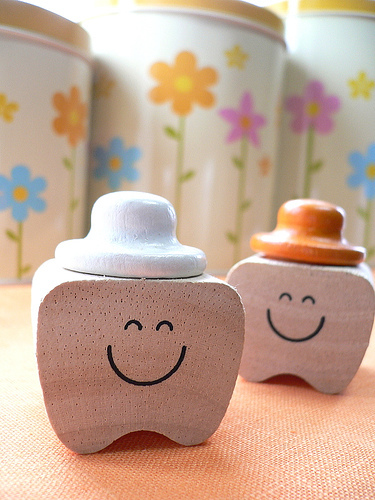 Thanks to the talented and obviously delightful yomi955 on Flickr for use of the excellent Japanese milk-tooth holders photo. I love my bit and when I use it regularly I can’t sleep without it. I like how the words “chomp” and “bit” go together. I love my bit, too! I just got it. Remember when I had one in college and called pizza “fleetza” when I wore it. That’s how Flon got his name, too. And, of course, your name fl. fl. I remember the fleetza and your affection for the bit, but don’t remember that that is how fl. fl. came about. Or flon for that matter! Clara and I would love to help you relax and unwind. Our backyard – complete with tiny slide for the babes and gurgling fountain for us – is a good place. Come on over sometime! Everyone agrees that bits are cozy and good! I am not afraid. I’m just uninterested in getting fitted and paying for one. And in developing a snoring habit. Rachel, I love your place, and I love that HAPS gets to play in your yard sometimes. Seeing fish and going down a tiny slide? I’m enraptured. Can we come next week? We are bit wearers in my house. They seem to help. Next, we need to discuss the cowboy boots and how you plan to wear yours; I have a pair in a similar style and am struggling. Hmmm. Perhaps alcohol might replace the bit? Everyone seems so pro-bit here, but I dare say that my husband’s multiple beers per night seem to unclench his jaw quite nicely. Just an idea. And I too love you, unusual dentist! Although I wouldn’t want my own cheerful German dentist to feel bad, or his aging dental assistant who gave me a spontaneous Christmas present because I so enthusiastically listened to her Facebook love story.